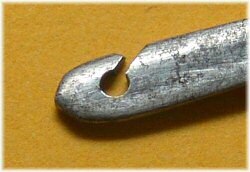 The Meccano reed hook was introduced, along with the other special loom parts, in 1916. It was added to the largest outfit (number 7) in 1921. It was also supplied in the 7 outfit's replacement (the Outfit L) in 1934. With the new numeric outfits 1 to 10 in 1937 the reed hook and many of these special parts were dropped, although it was still available as a spare part until production stopped in 1941. It was never reintroduced. A picture of the end of the reed hook is shown here, as many viewers of this site might not have seen one of these in the flesh. The reed hook has only one purpose – to assist with stringing the warp threads on the Meccano loom. The hook is passed between the reeds, the warp thread is hooked on, and pulled through. In my experience it is possible to 'post' the reed hook not only through the reeds but right through the correct healds too, and draw the thread completely through the appropriate holes. It would be extremely difficult and time-consuming to thread a loom without this tool, or at least one very much like it. William sent me a picture of the end of a different reed hook, where the slot has a very much more pointed end. It's unclear whether this is the 'right' version and the one above is broken, or whether the notch was deliberately cut to make it easier to thread the hook. Perhaps when we've got a few more photos together we might be able to make a better decision. Nigel Collins has pointed out that there is a wrapped example of part 105 shown in the "Bible", on page 328 (Hornby Companion Series Volume 6). However, the one there appears to be French, by the look of the yellow and red scalloped label. About as good as we're going to get, however. Some opportunistic spotting by Richard has produced this example too, looking similar. Are these parts from Binns Road, do we think? Most of the parts I've seen with this sticker are French, but I might be wrong, as usual. I thought I'd point out that Reed Hooks aren't a Meccano invention - they were in widespread use in the weaving industry - and examples looking very similar to the Meccano part do appear from time to time. It strikes me as a distinct possibility that these items were a stock trade tool bought in by Meccano and are likely therefore to have a number of variations. Also, I have to tell you that the blade is some sort of spring steel (you'll know that if you've ever tried to bend/straighten one) - nickel silver it ain't!!! Re the pictures above: the pointed end to the notch is the 'right' verson. I'd venture the other one shown is broken or was altered. Some wonderful material coming to light on this site. Please keep up the good work!! FYI, re the Reed Hook: There are at least two versions that I'm aware of - those with and those without the brass ferule around the handle. I have a handful of those 'without' in a 1917 dealers cabinet. Reply: You're right! However, the sticker on that appears to be the French variety, showing it to be a French-made part. Although it's hard to tell shades from the picture, the handle looks much more pink, too.